Looking at things differently is a curious exercise, it seems to me. For instance, if you stand some work tables vertically they become paintings (Quadre per ser vist, Jordi - Painting to be seen, Jordi), and this feeling becomes even stronger if they're placed in a display window that you can observe from a bench. In the days following my conversation with Enric about this text, I fix my gaze on elements that were previously landscape and routine, things that were "mine" but aren't anymore. They no longer belong to me; they're at a remove and create a new awareness within me. I respect them for what they are: autonomous and subjectivised entities. Like ideas, like authorship. Belonging to everyone and no one; belonging to themselves. I get up one day with the sudden thought of looking through the keyhole. That feeling, that distance. That prying and watchful observation. Enric Farrés Duran approaches his exhibitions as a totality, and that's how we should try to understand them. The sources are intense and branch out, while the layers of interpretation peel away from each other. Certain elements follow these lines and offer us a way into his work, a way to observe through a certain manner of being and seeing. For those of us who were born in the 80s, bossa nova, and samba before it, could be classified as the type of music that makes it easier to imagine a generation before us that was decidedly more sensual, fun and alive. Perhaps it can only be matched by a certain kind of rock and roll or funk. At any rate, what I'm interested in is capturing this melancholy, of flesh once firm and bodies once vibrant. Bodies of others that we would have liked to inhabit, moments that are inside us even though we haven't experienced them. Intrusive melancholy, like when admiration also goes beyond the intellectual and, from a fetishistic perspective, we visit their home. In the case of the architect Lina Bo Bardi it works to perfection because Casa do Vidro (Glass House) in theory forms part of her body of work. We visit it in order to see it but also in order to be in it for an instant, to touch its objects, to inhabit its spaces. There's a Brazilian feel in much of what we'll see (or won't see, because we can easily miss the details if we don't pay attention) in this exhibition comprising two spaces and many corners. Brazil is present in the bossa nova of unlived memory and in the samba sung by Elza Soares and Roberto Ribeiro 1 at the end of Res és meu (Nothing is mine), the video-recorded play shown in the Pou Rodó space. Brazil is also in the tribute to the architect Lina Bo Bardi, whose famous displays designed for the MASP (São Paulo Museum of Art) are incorporated by Farrés Duran in Bòlit_StNicolau. These revolutionary exhibition supports consist of a concrete plinth and a glass structure which transforms the pieces on display, turning them from images into objects, observable from more angles (the glass structure not only enables viewers to see the reverse of the paintings but also to walk around them). Moreover, from an architectural perspective, the plinths free up the walls, which can consequently incorporate windows and, therefore, natural light. They also offer an alternative to the linearity of the wall, which until now has defined the layout of both spaces and paintings. 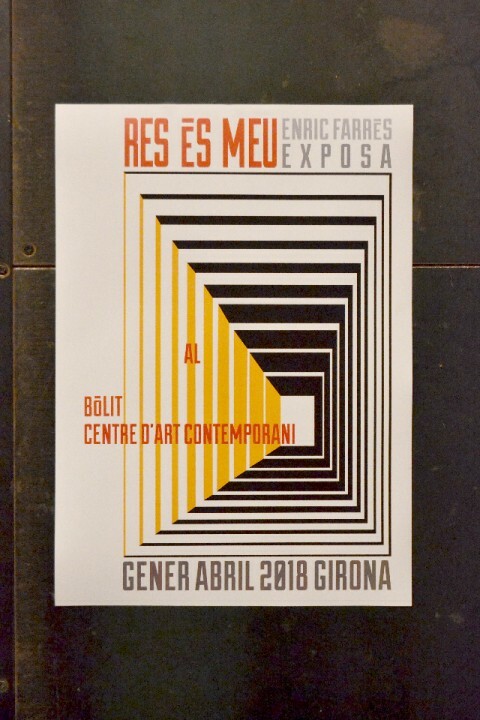 Walls that are once again a crucial element, as they were in Una exposició de mirar (An exhibition of looking) at La Panera in Lleida, which served as a precedent for Res és meu (Nothing is mine) at Bòlit, Girona. They are cut through, connecting the inside and outside, enabling us to spy out from within the space. 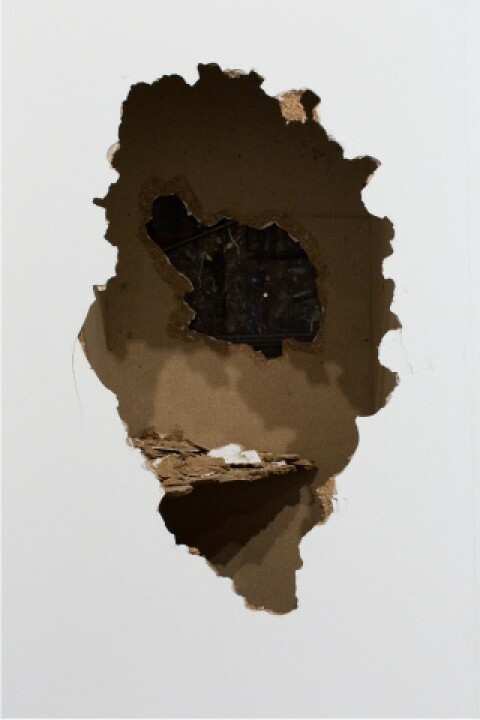 Walls that lead us to gaze is if we were doing so through that hole in the wall, with that distance. Walls we must climb in order to get a view (Lavabo - Toilet, by Torres Monsó). Or walls and their absence (Objecte ficció #un display discapacitat - Object fiction #a disabled display), which stands out in particular in Bòlit_StNicolau. Brazil is also in the exhibition poster, in the form of a graphic (one of Enric Farrés Duran's other interests) that recalls the poster of the first São Paulo Art Biennial (1951), by the artist and designer Antônio Maluf, a practitioner of concrete art who focused on the relations between art and architecture on more than one occasion. And Brazil is also in the title of the exhibition, Res és meu (Nothing is mine), since it unintentionally (or maybe intentionally, it's never straightforward with Enric) recalls the Cannibalist Manifesto published in 1928 by the Brazilian poet Oswald de Andrade, which identifies cultural "cannibalism" as the main identity trait of Brazilian culture. It's worth mentioning that this manifesto would later be considered the inspiration of Brazilian modernism (a movement of emancipation involving poetry, architecture, visual art and politics) and a forerunner of the movements opposing European postcolonialism. There is cannibal authorship in how Farrés Duran gobbles up in the same way Meier's bench or Bo Bardi's plinths; a manuscript by Pla or part of the collections of the Art Museum of Girona and the History Museum of Girona; the (unintentional) abstract expressionism of some Fine Arts students from the University of Barcelona or a Calder that isn't there (Res és meu - Nothing is mine). Everything is borrowed, including the photograph entitled El Cul, of unknown authorship, which the artist came across in a flea market in Valencia. All gobbled up. "Nothing" is all that belongs to Enric Farrés Duran, this empty space he offers us, this universe of playfulness and intrigue between what you look at and what you see, what you know and what you imagine, what is the right way round and what is back to front, what belongs to someone and what belongs to no one. There is authorship and its concealment in Biblioteca sense títols (Library without titles), in which books are turned around in order to erase their title, mark, trace and name, and in which on the flipside, a compilation is shown of the publications produced by Enric Farrés Duran over the length of his career (Publicacions especials i llibres d'artista - Special publications and artist books). There is authorship that turns the style of John Berger on its head, speaking about ways of looking, showing a flipside (Col·leccions dels Museus de Girona - Collection of the Museums of Girona) which furthermore, as in the Bo Bardi display, is capable of showing, questioning the mechanisms through which a thing is. Imprint, mark, archive. Trace, record, memory. Memory of that which we haven't experienced. Memory of this nothing that is so much a part of us. Staging. The theatre staging leads on from the exhibition staging which is also entitled Res és meu (Nothing is mine). The play is staged in Bòlit_StNicolau during the assembly of the exhibition. It's structured as a progressive display that gradually takes shape, assembling itself, enabling the observation, step by step, of each element of the whole. Theatre staging with an audience seated in two rows of chairs facing each other, in between which there is a space with nothingness in it, lighted only by the stage spotlights, intensifying the sense of emptiness before everything starts. "Nothing" is yours, says Enric Farrés Duran. Staging as structure, as a raw concept, as that which is not normally seen but which now takes on an identity as we observe it. A spatial staging that pays tribute, once again, to the work of Lina Bo Bardi and her Theatre Office built in São Paulo, Brazil. 1 Swing Negrão (Elza Soares, Brasil Pandeiro (Assis Valente), O Samba Agora Vai (Pedro Caetano), É Com Esse Que Eu Vou (Pedro Caetano), from the album Sangue Suor e Raça, 1972.hing is mine), everything is very much his own. *Picture: Fragment of Quadre per ser vist 2017. Installation at Centre d'Art La Panera. Photographer: Pau Ardid.